Hey, all! 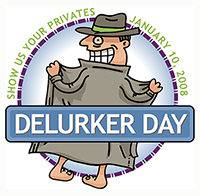 Chris over at Rude Cactus has spread the word that it’s DELURKER DAY. So, if you stop by and read The Mom Chronicles, please de-lurk and leave me a comment today. I’m sure I’ll be back with entertaining content tomorrow. Yahoo! I heart Delurking Day! Not that I’m capable of lurking as I always feel the need to put my two cents in. Love the button. Too funny. Hi! I enjoy reading your blog. Just jumped over from Alissa’s blog to say “hi”!